A story broke at the beginning of the month about a couple of campaigns out there in the social media universe. Both piggybacked on two of the UAE’s most established brands. Essentially, the two campaigns offered those who followed the chance to win free flights with Emirates Airline and Etihad Airways. According to the UAE’s English-language newspaper The National which broke the story here in the UAE, the promotion launched on the picture-sharing site Instagram and stated that the first 20,000 people who would follow each account and would share the respective campaigns with a specific hashtag would receive free tickets for themselves plus one to Dubai or Abu Dhabi. The Emirates Instagram account was named EMIRATESPROMOTION while the Etihad campaign ran under the hashtag #EtihadPromotion. The branding is there, the name may be dodgy, but there’s no official Emirates account. So why not believe it? Too good to be true you may think, and the campaigns were fake. That didn’t stop 10,000 people following the fake Emirates account which featured the company’s logo and photos skinned from the company’s website. I don’t know how long the fake competitions were up and running for, but both Emirates and Etihad put out statements warning people not to fall for the fake campaigns. The Emirates statement is below. When we launch competitions or new social media channels, you will be the first to know via our Facebook, G+ or YouTube channels and on emirates.com. How does this concept sound to you? There’s lots of random people out there on social media, and scams and the internet aren’t mutually exclusive. So why do brands focus on some social media channels and not others? 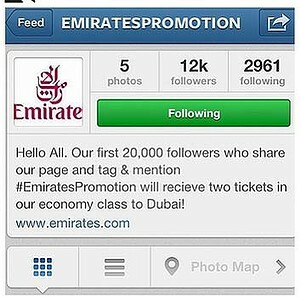 For example, both Emirates and Etihad don’t have Instagram accounts. Emirates doesn’t even have a Twitter account. Wouldn’t it be best for a brand simply to park their presence on the major social media channels (no one can do everything on social media, there’s simply too many channels and sites out there). And this point may be even more relevant albeit off on a tangent for Emirates, which spends several hundred million dollars on sports marketing (the most recent announcement being the tie-up with Formula One). Isn’t the airline missing out through not focusing on social media? Imagine how much Emirates could achieve in brand positioning and amplifying that sports marketing spend by promoting itself through social media. As I’ve said before, technology is a wonderful leveler. It’d seem a waste not to wring every single penny in return on investment from those mega-bucks sports sponsorships. 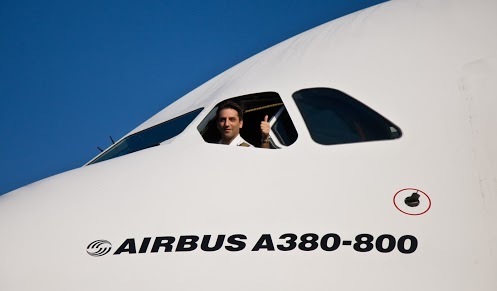 So next time you see a promotion which is too good to be true just send a Facebook message to the airlines and ask them if they’ve gotten round in Instagram (or Twitter in Emirates’ case). And, as they say in France bon chance! This gentleman clearly feels Emirates would benefit from more social media presence. Do you? This entry was posted in Marketing, Social Media, United Arab Emirates and tagged Emirates, EmiratesPromotion, Etihad, EtihadPromotion, facebook, Google, instagram, online, scam, social media, twitter, youtube by alexofarabia. Bookmark the permalink.